Yes, it is true that Diddy usually publishes a bunch of vlogs that seem silly. 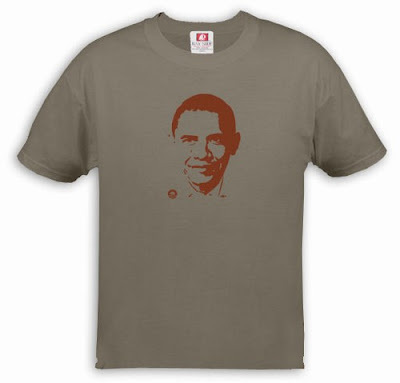 But this one is part of his daily series promoting the '08 vote. This one is especially worth watching because he's got his twin baby girls with him. D'Lila (on the right) is especially cute as she parrots what her daddy says and gets "Obama" right every time! 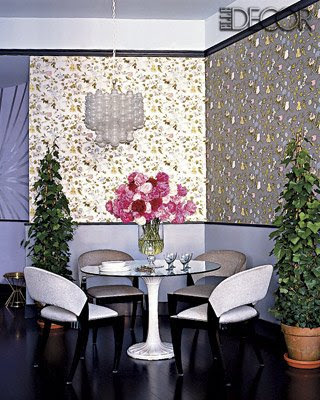 Jessica Stam's "jewel tone paradise"
In this month's issue of Elle Decor, the NYC home of model Jessica Stam (of whom Marc Jacobs' "Stam" bag was named after) comes to life. Described as a "jewel toned paradise", the East Village apartment was designed by Rafael DeCardenas, who indeed has an eye for feminine grace. While I admire the beauty of the proportions and the mix of high-fi and lo-fi (several pieces were purchased off of eBay), the setting seems a bit removed. I think I prefer a space that is just as edgy but a bit more cozy. It's hard for me to imagine curling up in this space with a pile of magazines or a good book. What do you think? Politics and fashion have merged for the current campaign (arguably the most important presidential election in the country's history). Fashion has called upon a new subject in Mr. Obama. 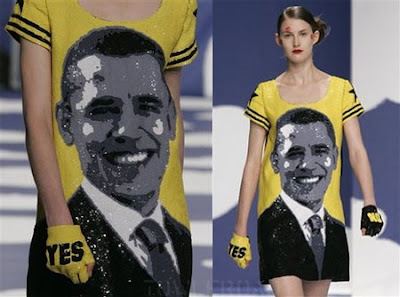 Case in point: the first ever sequined Obama dress made its runway debut at the Jean-Charles de Castelbajac 2009 ready-to-wear show in Paris. 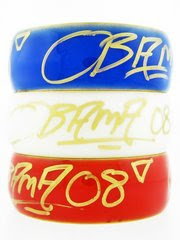 And there's plenty to choose from outside the haute couture/runway world with so much to choose from...grafitti bangles for Obama from BYLU (note $50 of each bracelet's purchase price will go to his campaign). 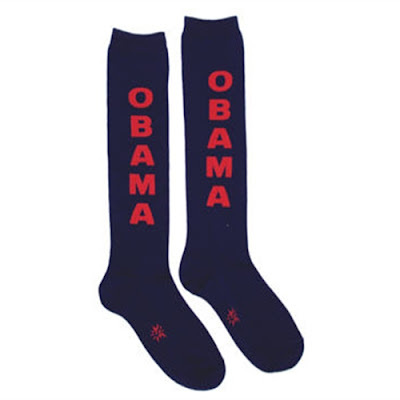 And there is no shortage of t-shirts, knee socks to go with...check out ShopFlick's Obama superstore.